China scored a stunning, history making success with the successful touchdown of the ambitious Chang’e-3 probe with the ‘Yutu’ rover on the surface of the Moon Dec. 14, 2013, on the country’s first ever attempt to conduct a landing on an extraterrestrial body. The dramatic Chang’e-3 soft landing on the lava filled plains of the Bay of Rainbows occurred at about 8:11 am EST, 9:11 p.m. Beijing local time, 1311 GMT. The monumental feat is the first landing on the Moon by any entity in nearly four decades. It was broadcast live on CCTV, China’s state run television network. This marks a milestone achievement for China and clearly demonstrates the country’s technological prowess. The voyage from the Earth to the Moon began 12 days earlier with the flawless launch of Chang’e-3 atop China’s Long March 3-B booster at 1:30 a.m. Beijing local time, Dec. 2, 2013 (12:30 p.m. EST, Dec. 1) from the Xichang Satellite Launch Center, in southwest China. Chang’e-3 made a rocket powered descent to the Moon’s surface by firing the landing thrusters starting at the altitude of 15 km (9 mi) for a soft landing targeted to a preselected area on the Bay of Rainbows. The powered descent was autonomous and took about 12 minutes. The variable thrust engine enabled Chang’e-3 to reduce its deceleration as it approached the moon. The descent was preprogrammed and controlled by the probe itself, not from the ground. It was imaged in high resolution by China’s prior lunar mission – the Chang’e-2 lunar orbiter. 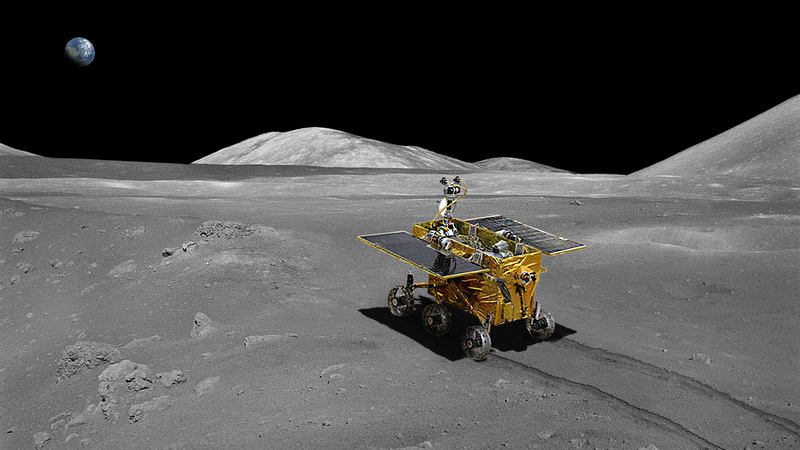 Yutu, which translates as Jade Rabbit, stands 150 centimeters high, or nearly 5 feet – human height. It weighs approximately 120 kilograms and sports a robotic arm equipped with advanced science instruments. Authored by Ken Kremer, an expanded version of this article appeared first at www.universetoday.com.